Wendy Botwright is up early letting the four dogs and cats out while she makes a cup of tea, gets ready for work and starts to organise the rest of the family. Her daughter, Rosey is doing her GCSEs and her son, Jack works with his father, Wendy’s husband Mark, on their Garlic Farm in Higher Chilfrome, Dorset. 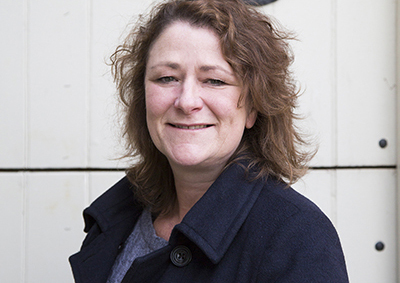 Although Wendy does all the paperwork for the family business, she also has a full-time job as Business Development Manager at Symondsbury Estate, based at Manor Yard. Sipping at the coffee usually waiting for her when she gets in, Wendy checks her emails first. Responsible for the Marketing and Sales teams, she initially helped renovate the holiday cottages with the owner of the family estate, some six years ago. Now, with the once derelict Manor Yard area refurbished, boasting café, shop, artisan and commercial units, bike park and the Tithe Barn for weddings and events, she is refocusing on the holiday cottages once more. Lunch brings a break from her desk as Wendy usually escapes for a walk. Although sitting at her desk for a lot of the day, she can gaze out the window to see what the gardeners are planting in the vegetable garden for the café. Today, it’s potatoes. Home means cooking supper and then starting on the emails and orders for the next day on the Garlic Farm. The family also have a horse, chickens, sheep and cows; ‘Lad’ the collie pup is being trained to be the next cow dog by Mark and Jack. ‘I’m not very good at relaxing and am happier when doing something’ says Wendy. ‘Having just moved to the farm six months ago it’s fantastic to be able to walk out and see the garlic growing on our doorstep as we’re busy laying the hedges and smartening the place up. It’s a dream come true’.